It was called one of the worst stadiums in the NFL during its time and few fans and players are sad that Veterans Stadium is now only a memory. After playing at an aging and deteriorating Connie Mack Stadium/Shibe Park, along with the Philadelphia Phillies (MLB) and at Franklin Field, the Eagles along with the Phillies wanted new stadiums built. By 1961, both the Phillies and Eagles had planned to be playing in a new multipurpose stadium. However 1961 came and went because of disputes over where the stadium should be built. In November 1964, a referendum was approved by voters to build a stadium. By 1966, two locations for a new stadium were still being debated while the cost of construction rose. On October 2, 1967 ground was broken for a new stadium in south Philadelphia. Named Veteran Stadium, the facility was completed in just under four years. The Philadelphia Phillies (MLB) played the first game ever at Veterans Stadium on April 10, 1971. Being a multipurpose stadium, the Philadelphia Eagles played their first regular season game at Veterans Stadium on September 26, 1971 against the Dallas Cowboys. When it opened, Veterans Stadium was one of the NFL’s largest stadiums with over 62,000 multicolored seats circling the Astroturf field. In order for the stadium to be converted from baseball to football, rollaway seats were used. The seats used for football, were rolled underneath the stands behind the outfield wall when the stadium was in baseball configuration. Very few changes took place at Veterans Stadium during its existence. Between 1985 and 1987, 89 luxury Penthouse suites were built atop the stadium. In the 1990s two new video boards replaced the original scoreboard and all the multicolored seats were replaced by blue seats prior to the start of the 1996 baseball season. For many years Veterans Stadium was known for its terrible Astroturf. After the 2000 NFL season, the Astroturf was removed and replaced with NexTurf, a thick plastic grass. In the late 1990s, both the Eagles and Phillies wanted new stadiums. Construction on the Eagles new stadium, Lincoln Financial Field, began in 2001. 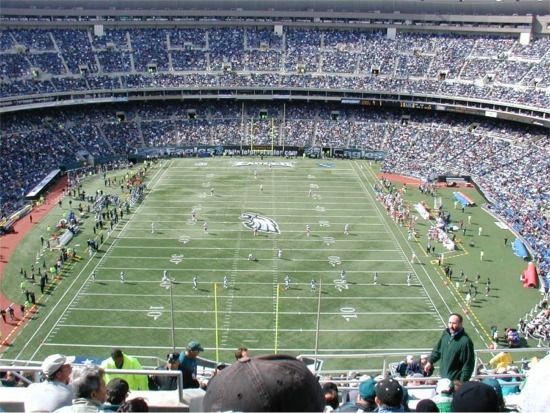 The Eagles played their last game at Veterans Stadium on January 19, 2003. Veterans Stadium closed in October 2003 and was demolished on March 21, 2004. It is now a parking lot for the sports complex.